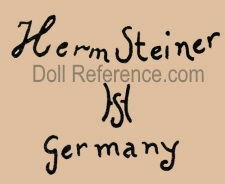 Hermann Steiner of Sonneberg and Neustadt, Germany and in Bavaria, entered the doll market at the end of the German bisque doll era and began producing dolls around 1920. 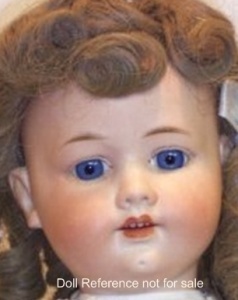 They are probably best know for their character baby or infant dolls, which were the doll of choice, at that time. 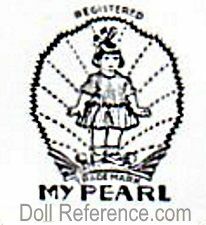 A 1921 registered trademark name is My Pearl doll. 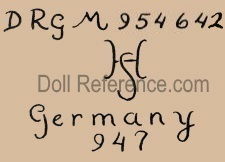 Hermann Steiner appears to have supplied dolls to Moses Kohnstam & Company, as their MOKO mark plus the HS Steiner mark have been found on dolls. 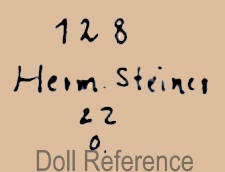 H. Steiner's London agent was Boult, Wade & Tennant and in the USA the distributor was Roth, Baitz & Lipsitz. 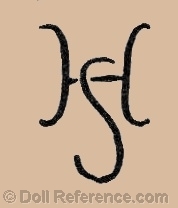 In 1926 the company name was changed to Porzellanfabrik Hermann Steiner. 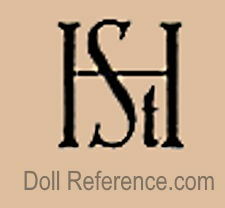 H. Steiner produced bisque, composition and celluloid doll heads with glass or painted eyes, molded hair or wigged with a body of cloth, kid leather or composition, black or white dolls. 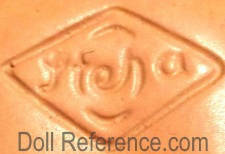 Sometime between 1940 to the 1960s Hermann Steiner became Steiner & Hauser, also called Steha Doll & Toy Company and used the combined company name initials of Steha for their mark as shown below. 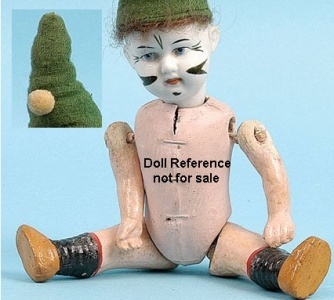 1920+ Hermann Steiner Character Baby doll, Bye-Lo Baby doll type look a like, 8-16" tall, bisque head with flange neck, painted or glass eyes, solid dome head with molded painted hair or wigged, closed or open mouth, cloth or jointed composition body, bisque or composition hands, usually marked: HS Germany, 240, 246, 401. 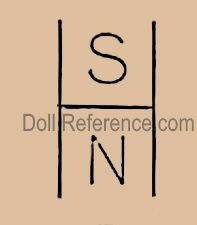 This infant character doll was also made with a composition head and hands. Hermann Steiner doll mold 947 is a composition head doll with googly disk eyes, closed smiling mouth, on a all cloth jointed body, usually marked DRGM 954642 HS Germany 947. 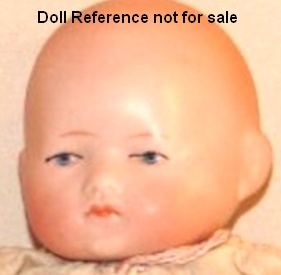 1920+ Pierrot Clown Baby doll, 8"
Also, Tessie, doll mark, HS a size number, Moko Bavaria or Tessie Germany a size number, for the Moses Kohnstam Company. 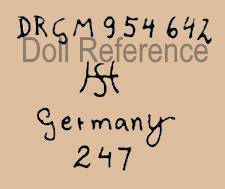 1920+ Hermann Steiner Dolly face doll, 22"
and some Hermann Steiner doll bodies are stamped 954642 as shown below.